In response to changes in both domestic and international trends and constraints in resources, many global industry giants have turned their attention to Circular Economy. 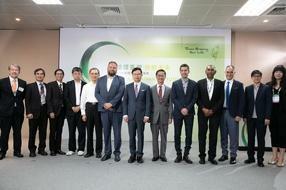 On September 19, 2018 Green Trade Project Office (GTPO) under Taiwan’s Ministry of Economic Affairs hosted the Circular Taiwan For a Brighter Future 2018. During the roundtable discussion, Terry C.R. Tai, Chairman of Taisun International Holding Corp. (one of the leading manufacturers in Asia for personal hygiene care products) shared some of his experiences and insights in environmental protection, having worked for over 20 years in ASEAN countries. He stated "As long as you have the technical ability and willingness to try, be brave and step out." Aaron Chen, COO of TCI Academy shared on "Zero Carbon Emission". The company uses agricultural products such as peels or peanut shells to produce healthy foods and skin care products which are sold to over 49 countries around the World, creating a circular economy opportunity for agricultural products. Mr. Chen said that in his own business model no matter which country they entered, the first step is to export Taiwan's functional products for R&D. The second step is to cooperate with local scientific research institutions. Jenq Jang Ou, President of CHC Resources Corp. which specializes in environmental protection said that China Steel Corporation has operations in New Southbound countries for over 20 years. She suggested that Taiwanese companies that want to invest in the development of circular economy must fully integrate and cooperate with local enterprises and industrial chains in order to leverage their efforts. Annie Peng, Director of All Cosmos Bio-Tech Holding Corp. shared how to use organic fertilizer and microbial technology to target green agriculture and circular economy, becoming the largest compound fertilizer manufacturer in Malaysia. Leonor F.M. Lin, Executive Vice-President of Taiwan External Trade Development Council (TAITRA), whom served as the moderator of the roundtable discussion pointed out that for many new southbound countries, they are growing economies that are growing in environmental awareness, prompting them to find new solutions. It is a business opportunity for Taiwanese companies, and TAITRA together with GTPO are actively cooperating with Chung-Hua Institution Economic Research (CIER), and Industrial Technology Research Institute (ITRI) to continuously find green business opportunities and look for quality international professional exhibitions to take everyone together. GTPO provides the Green Customer Exploration & one-on-one consultations. Companies that are interested can make good use of these opportunities to bring out Taiwan's strength in sustainable development to the world, make the global circular economy market bigger, and let Taiwan become a hot spot in the international recycling economy.